Even with perfect eyesight, some students have problems tracking side to side when they read. It’s a problem that’s more widespread than most parents and teachers realize. More and more parents are expressing concern over the discrepancy between their child’s academic performance (grades) and their standardized test scores (PSAT, SAT, LSAT, GRE etc.). They often report no prior classroom accommodations and nor any eye sight problems. Neil Simon, one of this generation’s most prolific and insightful playwrights, said it best in his play, “Same Time Next Year”, when he commented on the natural progression of life’s toll on our seemingly youthful and invincible bodies. We’re periodically asked about the application of Irlen tinted lenses or filters for persons having difficulty reading or learning. Helen Irlen, a psychologist, introduced the concept of “Scotopic Sensitivity Syndrome” (SSS), a condition suggestive of vision problems when reading. These are some questions Dr. Dan Fortenbacher is asked by parents almost every day at St. Joseph Vision Therapy in St. Joseph, Michigan, a comprehensive diagnostic and therapy services center. Schools are very adept at assembling teams of professionals who conduct tests with the goal of placing labels on your child. One of the common labels is “Perceptually Impaired”, or P.I., and the other is “Neurologically Impaired”, or N.I. What is the purpose of these labels? 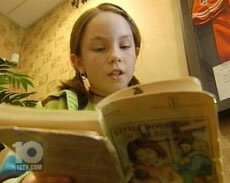 Dyslexia is a term that is used more widely in some areas of the country than others. Although there are different definitions of the term, which literally means “difficulty with words”, it represents one aspect of reading disability. Children with serious problems in binocular control tend to telegraph this in noticeable behaviors. They frequently rub their eyes, squint at the page, cover one eye or turn sideways to read, or move their head from left to right instead of their eyes. An eye tracking problem is one of several visual problemsthat contribute to learning-related vision difficulties, according to the College of Optometrists in Vision Development, or COVD. Problems with eye teaming, binocular vision, visual-motor integration and visual perception also can lead to learning-related vision disorders. Your eye is basically a very smart receiver and transmitter. What makes your eye so smart is that it’s retina, or screen, it a direct outgrowth of brain tissue. In fact, the optic nerve which enters and exits the back of your eye feeds information directly to the brain. Video: Why Doesn’t My Child Like To Read? I am writing to thank you all at your office. Visual therapy has been major blessing in this house. My son, Peter, has benefited so much from it. His life has turned on to a path of ability, achievement and potential. this path and these destinations were not open to him prior to visual therapy. Section 504, part of the Special Education law, provides a method for schools to accommodate children who are in need of special arrangements to improve their educational environment. In my experience, “visual tracking” is a term that seems to be universally recognized by classroom teachers, yet frequently misunderstood for the relationship of this visual ability to reading and learning. When a child struggles in school it is not only an academic problem. That’s just the tip of the iceberg. When a child struggles to keep up with their peers, it affects them emotionally, socially and physically. What is particularly troubling is how children with vision related learning problems often have emotional fallout that affects their self-esteem and can cause a spiralling of problems to cascade. Written for parents as “insider advice on how to navigate the system and help your child succeed”, authors, Linda Wilmshurst, Ph. D. and Alan W. Brue, Ph. D. published their book entitled: A Parents Guide to Special Education. Collectively, the doctors that form this vision help network have had the pleasure of meeting with hundreds if not thousands of parents during case conferences. Getting to know parents better, and having a more complete of understanding of their child and family situation, is an important ingredient in the vision therapy process. The optometrist led Adam through a series of simple tests designed to tell whether his eyes were tracking and working together properly. She held up a finger and asked Adam to follow it with his eyes. As her finger passed in front of Adam’s nose, Wilma Schunke saw her son’s eyes quiver, something she had never seen before. Working with a special needs child to develop skills necesssary for success in the classroom and life can be rewarding, but also challenging and frustrating for parents, family, and teams of teachers, doctors, an therapists. So much of our attention gets focused on the child who is not achieving, that we tend to lose sight of gifted children who are achieving but well below their potential. Symptoms of Vision Problems that Cause School Troubles. Current research indicates that approximately one out of four children have vision disorders that interfere with their ability to learn. Even if a child passes the standard basic vision exam with 20/20 visual acuity, it is still possible to have inefficient visual function which affects learning. More and more parents are expressing concern over the discrepancy between their child’s academic performance (grades) and their standardized test scores (PSAT, SAT, LSAT, GRE etc.). Byron P. Rourke, cofounder of the Journal of Clinical and Experimental Neuropsychology, is considered to be the first professional to have coined the term “nonverbal learning disorder” or NLD. What do you think of when you hear the words “perfect” vision? If you’re like most people the first thing that comes to your mind is 20/20 eyesight. But what does 20/20 eyesight really mean? Could Vision Issues Be Contributing to Your Child’s Difficulty With Learning? Parents and educators often ask us questions about vision therapy and if it can be helpful for children with LD. While vision problems are not the cause of dyslexia or other learning disabilities, vision issues such as convergence insufficiency can certainly interfere with learning and contribute to difficulties with attention and behavior. 10 things to know about the hidden vision problems that affect learning.